Nitrogen Wheels Rims | Wheel Specialists, Inc. 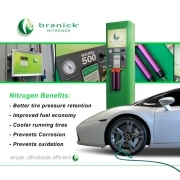 In a consistent effort to always stay one step ahead of the game, Wheel Specialists, Inc. has installed a Branick brand nitrogen generator to aid in providing our customers with the best possible wheel & tire buying experience possible. Many of the vehicle manufacturers have converted to nitrogen due to the benefits that it offers a car owner in both efficiency and performance. There is an additional charge for the utilization of nitrogen over standard air, but if you read below it will be very clear to you that the cost is well worth it. Tires will run about 20 degrees cooler with nitrogen. Air seeps out of a tire casing 3 psi (pounds per square inch)a month compared to .5 psi with nitrogen because the molecules are larger. For every 10 degrees of temperature change your tires increase or decrease 1 psi. In Arizona the temperature can change 40 degrees from night to day, when you combine that with a long drive on the highway the change could be up to 7-8 psi. Nitrogen does not fluctuate as much, therefore the tire runs true and wears better. Visit http://www.getnitrogen.org and use this to figure out how much money you, the customer, can save per year by using nitrogen. You may be very surprised once you do it. Ex: Customer drives 15,000 miles a year with a vehicle that averages 18 mpg with tires that cost $200.00 each with an average gas price of $3.00 per gallon. They will save $200.16 per year.